Immigration has long been an issue of contention within the European Union, with Italy ramping up its defences in recent years. But a photo shared on social media by Italian Minister of Interior, Matteo Salvini, has sparked controversy. On April 10th a migrant boat was spotted near the Libyan coast. Those on board reached out through Alarm Phone, an NGO that runs a rescue hotline number and supports rescue operations. The NGO detailed the events on their social media feed. The migrants told the NGO the boat's engine had stopped working and 8 people had already fallen into the sea. An aircraft from NGO Sea-watch started to monitor the case and confirmed the existence of a blue wooden vessel waiting to be assisted. They issued an alarm to the nearby coasts but there was no reply. Sea Watch has also confirmed that a European aircraft was seen throwing a life raft and leaving the area. 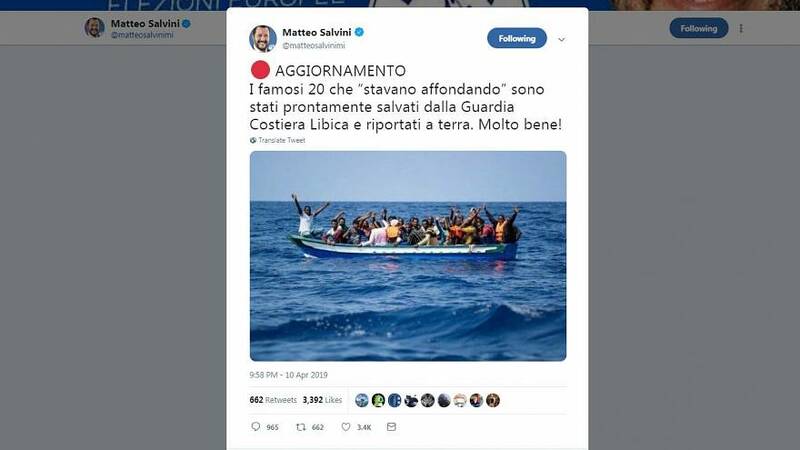 What did Matteo Salvini share? The Minister of Interior shared a tweet confirming the migrants had been rescued by Libyan Authorities, adding "very well!" The image he uses, however, dates back to 2018, and not of the event that took place. How do we know this is dated? The image features on a post shared by SOS Mediterranee Italia last summer. He has confirmed that the picture was taken as part of the Aquarius rescue operation on August 10, 2018. Over 140 migrants had been stranded on the Aquarius ship for 4 days before being allowed to dock in Malta. A deal was then reached for the migrants to be relocated in countries across Europe. Photographer Giuglielmo Mangiapane confirmed that he took the image. Speaking to The Cube, he said: "I took that picture from onboard a RIHB during a rescue operation performed by Aquarius". "As a photojournalist I always strive to do my job in a fair and ethic way and to tell people the story as it is. So I I am not happy when I see my work used out of its original meaning and context. it's disappointing," he told Euronews. As the run-up to the European Elections starts, immigration has once again become a key issue. Countries like Italy and Malta want to keep the migrants away from EU coasts. But NGOs are pushing back. Meanwhile, the UNHCR has recently evacuated 150 refugees from a detention centre near the country's capital, Tripoli with violence escalating as Field Marshall Khalifa Haftar's forces move in on the capital. The Cube reached out to Matteo Salvini's office for a statement but they had not responded at the time of publication.